I have been derelict in the writing of this blog. 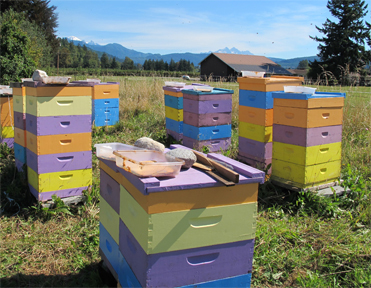 It’s been busy weeks – ok, busy months in the bee yard. I tend to stop working when the sun sets, and until recently, that has been 8:30. With darkness arriving early now, I have time to write (and sit in my truck at the local WiFi spot). In the mean time I’ve harvested that honey, found some nice, and not nice surprises, extracted the honey, bottled up the up-river and down-river honey, fed the hives, and am preparing them for winter. Which is all way too much for one blog, so I’ll concentrate on the more interesting aspects. Surprises at Harvest (ah, if they were only wonderful ones). I do not open my hives much. I judge the need to super by the degree of fill in the top box. If I can see seven frames full of brood, nectar or honey, it’s time to add another box. If there are brood in the top box, two frames of those get pulled up to the new super’s center. 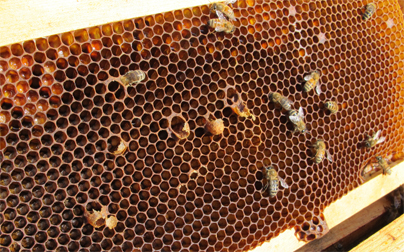 If it’s only nectar and honey in the nearly full super, then I will use some of those filled frames to alternate drawn comb with honey/nectar with foundation in the next super. All the above is to say that harvest is the only time I open up the hive all the way to the bottom box. Which is where the surprises can occur. This hive was a bustling bunch of bees until about 2 weeks before harvest. Pollen and honey coming in, supers filling up, top bars packed with bees. By harvest the hive was dwindling. What I hadn’t known was that the bees had decided to supercede – unsuccessfully. In the bottom box of a 7 story hive, chocked with honey and bee bread, were these queen cells, clearly eaten by an emerged queen. Only one problem: there were no eggs, and no brood. The queen who had emerged had failed to mate or had not made it back to the hive after a mating flight. On the positive side there was honey for me and honey/nectar frames for other hives. What Wings? Depressing, isn’t it? One weak hive had this little lady in it. Look at the wings. What wings? Yes, that’s the point. 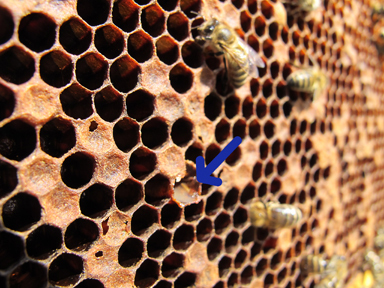 I’m figuring deformed wing virus linked to varroa, but perhaps she just fought another queen? If so, it’s a case of “you should have seen the other girl”, because her attendants really like this queen. The problem? Well, if she were bred, it wouldn’t matter because she’d be like a clipped queen. But she was not laying, so I figured a virgin queen brought down by deformed wing virus brought on by a varroa infestation… I gave her more time, but she never laid. She was removed and her hive added to another hive. AFB raised its ugly head again. Last year I lost 7 hives to this horrid disease. 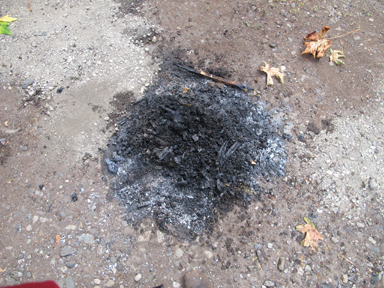 Killed the bees, burned the frames, charred the boxes, tops, bottoms, scrubbed them with bleach…the whole 9-yards. Checked the other hives, which looked clean. Clearly I missed something. (I am going to assume I did, it would be far worse to think that my bees encountered this elsewhere, in a location I cannot control). Conceptually I could have shaken the bees into clean boxes with new frames that had strips of foundation (or foundationless frames), then 4 days later I could have shaken them again into another box of new foundation. – Burning all the frames in the first and second group of boxes. That would have kept the bees. But this is September in northwest Washington state: no forage until next April! Thus that endeavor would have ended in dead bees or unhealthy ones living on vast amounts of sugar syrup. This is end of that 5-story hive. On the positive side, it was a strong hive so the possibility of it being robbed was low, but one never knows who is sharing what in the bee yard. Small up date: I’m sitting in that same bee yard, waiting for sunset, so I can kill the bees in another hive that, yes, has AFB. What’s a Bean to do? I’d already been removing all combs after 5 years of service, and moving out brood comb after 3 years. Clearly more is needed. Being a tad obsessive, I went though all my non-working comb and removed all combs that showed signs of being used for brood at all. Overkill, possibly, but it’s really depressing killing bees. I’d rather burn frames. Hopefully that will help. I guess I’ll see in the spring if other hives partook in the contaminated honey. On the positive side five hives that had to be rapidly moved due to a lost bee yard (change of owners) exploded with brood and honey in their new down-river bee yard. They must have flown out and been amazed that their world had suddenly been filled with easy pickings in agricultural lands rather than their previous up-river wilderness. Happy bees. Over all the majority of hives looked good. The honey harvest was pretty fair for what turned out to be an 8-week season (June rains had the bees inside eating all their spring honey). I kept the down-river and up-river supers separate, and now have two styles of honey from this year’s harvest. All very yummy. Here’s hoping that all your honey harvests went well and surprises, if any, were positive. This entry was posted in Beekeeping and tagged 2012, AFB, American Foul Brood, Bean, bees, Brookfield Farm, harvest, honey, Karen, Maple Falls, Washington. Bookmark the permalink. I stumbled on your website somehow and you are amazing to go though your ups and downs and actually document it. I am learning a lot from you. I don’t have trouble with mites yet Just a few earwigs and some ants that I get rid of with diatomaceous Earth (Natural) I too don’t heat my honey and don’t give any meds or sugar water. I have noticed that your hives are close to the ground. I have mine up 2 cinderblocks up. I have solid bottoms on mine still. I only have 4 hives and have been doing this for 3 years so far. I think that if I go to the screened bottom boards then too much cold IL air will come in from the bottom and kill the bees. I’m hesitant to do that. Siince yours are close to the ground. and on pallets, the pallets act as a insulator and not too much air goes in. I don’t want to keep changing from screen to solid every year either. I may try the screen bottom with a solid/semi solid plywood below that and them maybe some legs. I have yet to encounter AFB. I do know that the bees love new foundation. I recently added one new super and one cleaned out and the bees clearly love the new one. I didn’t put a new wax coating on the old one, so that may be something. I will try that next. I have been using the plastic foundation with ease. 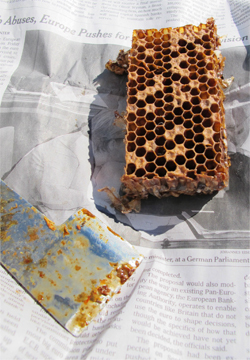 I have been told that the bees like the wax foundation better and the starter strip seems even better. It seems that the bees like new better than used? Do you find that true too? Have you tried boiling the frames boxes and or charring the boxes with flames, new frames though. I saw a video of that online where a specialist did that to a hive. Anyway, best of health to you and your family. Hi Teresa – nothing like getting back to you 3 months later…It’s been an “interesting” year here. Thank you for your nice comments. It sounds like you are doing brilliantly with your hives. As to your screened or solid bottom boards – you can buy, or make, bottom boards with a routered out area under or over the screen that a solid piece of wood or laminate can slide into. 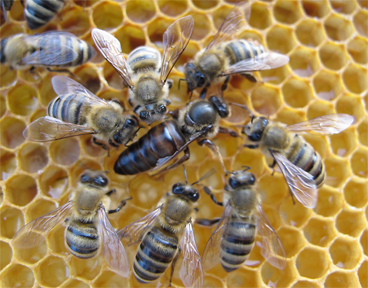 As to new or used: my queens seem to like laying in dark comb over new comb, but other than that, the bees seems to take either…it’s more about how much nectar is coming in for them. I’ve not heard of boiling boxes (that would be one huge kettle). I have charred boxes, but only after AFB or Nosema (all frames are destroyed in those cases). 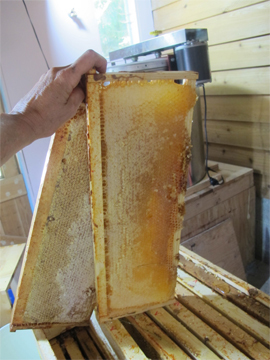 I know of one beekeeper with a set up big enough to dip all his boxes in wax – amazing to see. Keep up the good work.